A documentary marking the 70th birthday of Prince Charles was broadcasted on BBC One. 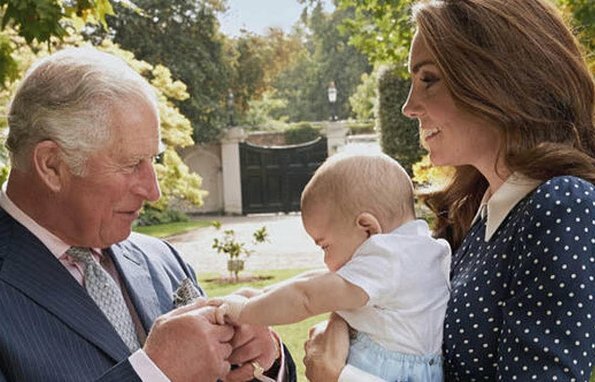 In the documentary, Prince Charles shared a photo showing himself, his youngest grandson Prince Louis and The Duchess of Cambridge. The photo was taken by photographer Chris Jackson at Clarence House Gardens in September. 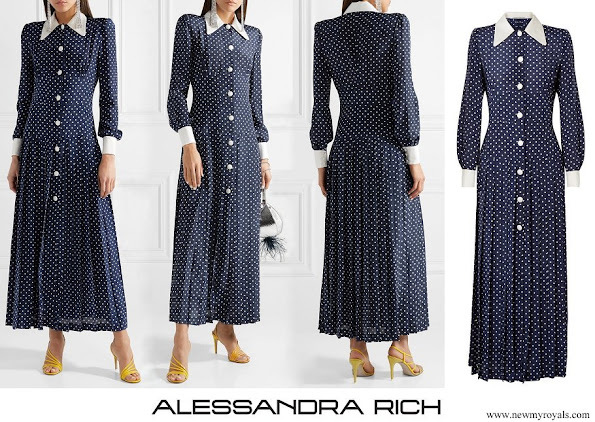 (In the photo, The Duchess of Cambridge wore polka-dot silk midi dress by Alessandra Rich). A special documentary to mark the seventieth birthday of HRH the Prince of Wales. What a lovely dress on Catherine. Little Louis having fun with Grandpa.Would be nice to see more pic's like this.The PoW is so busy he may not see enough of his grandchildren. Lovely picture, lovelier documentary. Loved it. That dress is so 'Catherine' (lol) and I'm sure she must look great in it even without us seeing more photos of her wearing it. Looking forward to watching the documentary. I read a very informative article about it this morning, and especially the comments from William and Harry on their father and their hopes that he can spend more time with his grandchildren in the future despite his very heavy workload and duty. Enjoyed the documentary very much. Prince William and Duchess Camilla seem to be persons with lots of prudence and foresight in their family relationships. Kate looks fab as always. Charles is surely not saving the planet. Let's never forget what he and his woman did in the 80s. Oh get over it! People aren't black and white - they are capable of both good and bad. Diana behaved no better. Franny, I agree with Anonymous 4:19. It is not about "being black and white". It's about the fact that Charles and Camilla knew the name of the game. Diana did not. They planned it. Diana did not. They had a choice. Diana had not (at least not when she was 20 years old and married). Good points, Coralie. At least William and Catherine seem headed down a healthier path for themselves and their children. I like her dress very much--modern and evocative of the 1940s at the same time. I disagree that they planned anything Coralie. It was a bad marriage and nobody behaved well. However, I don't believe that it's fair to judge people by one thing when they have done many good things as well. Diana had several affairs as well - including with a married man. Franny agree with you. Diana had at least five lovers, she broke also one marriage not her´s. She was no saint how ever good she was with manipulating media. I saw Charles document and I was amazed how he made already 1970 speech of plastic rubbish and climate change. I had no idea of cush things 1970. Charles deserves honor and I am happy he seems to have such a good marriage now with Camilla. Yes, this dress is very "Kate". Louis looks very much like George at the same age. I enjoyed the documentary very much. Clearly, Charles sense of duty comes from his mother, and as William and Camilla put it, he puts duty first. The Queen was able to leave her children for months at a time while on tour, which was considered normal at the time. William, Harry, and Camilla all express a wish that he will be able to reprioritize a bit, and make more time for the children. As important as his work is, family should come first. You only get one chance at that, and children grow up so quickly. I have a strong feeling we will see William be a very different Prince of Wales, and later King. He had the benefit of hands-on parenting and I am sure William and Harry will always want that for their children and grandchildren. I agree with Liza- such documentation was long overdue. I know some of his projects, which were unusual for the royals. He wasn‘t satisfied with pure charity. The Prince‘s Trust has helped a lot of disadvantaged young people into employment or business. It‘s just one example of many important activities for English society. And he does a lot without being in the limelight all the time. Charles is the best,no doubt about that.A very kind man to it seems.